Rice paddies cover the mountainsides of Yuanyang County, China. Constructed in “steps” by the Hani people for the last 1300 years, the slope of the terraces varies from 15 to 75 degrees with some having as many as 3,000 steps! The stunning colors that you see here are indeed real and result from the presence of water and certain plants within the terraces. Long-haul trucks wait in line to exit the Port of Los Angeles in California. It is estimated that there are approximately 3.5 million truck drivers in the United States and they drive nearly 140 billion miles on American highways every year. In total, 433 billion miles are covered annually by the entire population. Happy Easter! St. Peter’s Basilica, located within Vatican City in Rome, Italy, is regarded as one of the holiest Catholic sites and one of the greatest churches in all of Christendom. Construction of the church began in 1506 and was completed in 1626. The facility is seen here during the Pope’s mass on Easter Sunday in 2015. Key West is an island and city in the Straits of Florida, USA. It is the southernmost city in the contiguous United States and the westernmost island connected by highway in the Florida Keys. The island, which is about 4 miles (6.4 km) long and 1 mile (1.6 km) wide, has a population of approximately 25,000 and was visited by 2.25 million tourists in 2016. The Arlington National Cemetery's Columbarium, located in Arlington, Virginia, was opened in April 1980 as a resting place for cremated remains. It has nine courtyards and contains about 50,000 niches, with each niche accommodating up to two urns. The Columbarium is found in the southeast section of the cemetery, about a half-mile (0.8 km) from the Memorial Gate. Asunción is the capital and largest city of Paraguay, with nearly 2.2 million people living in its metropolitan area. Known as "the Mother of Cities," it is one of the oldest cities in South America and the longest continually inhabited area in the Río de la Plata Basin. 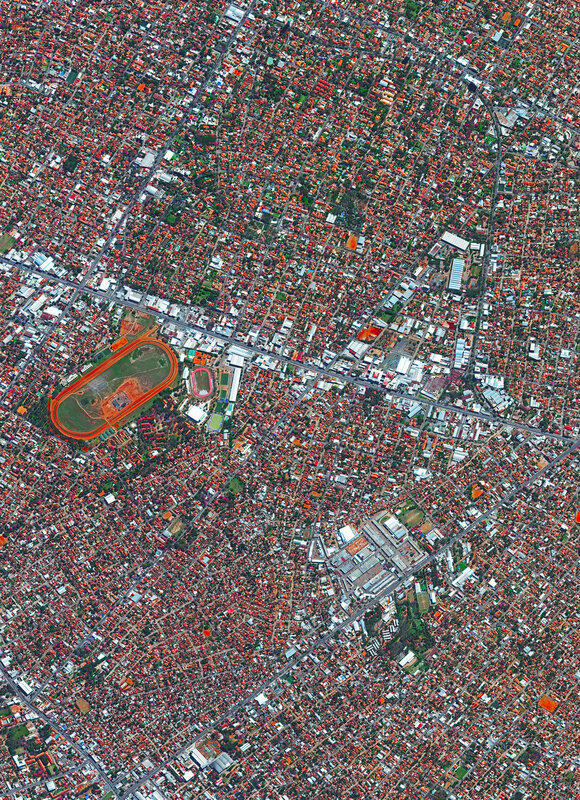 Shown on the left side of this Overview is the Hipódromo de Asunción, an 80,000-seat horse racing track and popular concert venue. On Monday, April 15, humanity lost timeless pieces of Gothic architecture when fire nearly destroyed Notre Dame Cathedral in Paris, France. The landmark, which took nearly two centuries to build, lost much of its 800-year-old roof and saw its 19th century spire collapse during the 15-hour blaze. Fortunately, its central structure is still intact, and French President Emmanuel Macron has pledged to restore Notre Dame within five years. This aerial photograph shows Notre Dame before the fire, and we hope to bring you post-fire imagery soon. Alakol Lake is a 1,020-square-mile (2,650 sq. km) salt lake located in east central Kazakhstan. The lake, which aptly translates to "multicolored lake," has varying shades of blue and green depending on its depth, levels of phytoplankton, and sediments flowing in from rivers and streams. Its mineral-rich water and mud are believed to be therapeutic, attracting many visitors who seek a natural remedy for psoriasis and other skin ailments. The Tom Bradley International Terminal, sometimes called "Terminal B," is one of nine passenger terminals at the Los Angeles International Airport (LAX) in Los Angeles, California. This terminal handles nearly all of LAX's international flights and can accommodate the Airbus A380 — the world's largest passenger airliner. In fact, LAX has more A380 services than any other North American city, with as many as 13 daily flights. Petare is a city in northern Venezuela, and is part of the greater Caracas urban area. With a population of nearly 370,000, it is considered one of the largest slums in the world. Homes in Petare are packed tightly together and many are stacked on top of each other along landslide-prone hills. Hạ Long Bay, located in the Quảng Ninh Province of Vietnam, is a stunningly beautiful destination. Here, towering limestone pillars and tiny islands topped by rich, green forests rise from the waters of the Gulf of Tonkin. Halong translates as 'where the dragon descends into the sea' and local legend suggests that this seascape was created when a great mountain dragon charged towards the coast, its flailing tail gouging out the valleys and crevasses in its path. The Pearl-Qatar is an artificial island in Doha, Qatar, spanning nearly 2.5 miles (4 km) in the Persian Gulf. Once completed, the island is expected to have nearly 19,000 dwellings and 45,000 residents. Twelve precincts make up the Pearl-Qatar, and each one has a national or international theme — including aspects of Arabic, Mediterranean and European culture. Montevideo is the capital and most populous city of Uruguay, with about 1.3 million residents — more than one-third of the country's total population. It is also the southernmost capital city in the Americas, located southeast of Buenos Aires, Argentina, across the Río de la Plata. Montevideo is divided into 62 barrios (neighborhoods), each with its own identity, geographic location, and socio-cultural activities.